We offer BOW TIES in assorted colors. 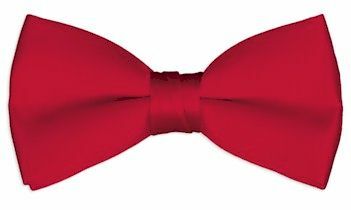 Description: Colored bow ties - Polyester satin pre-tied banded bow ties. Mens colored bow ties - size measures 2.5 inches high at the tallest point and 4.5 inches long. and clasps under the tie. The strap adjusts from 12.5 to 23 inches around the neck. and 3.5 inches long. The adjustable strap adjusts from 10.5 to 17.5 inches. Please select color to view. We offer a variety of black bow ties and assorted colored bow ties for men, boys / kids. 3 inches high bow ties. Also, available are mens colored bow ties and boys colored bow ties, in a variety of colors. For wedding and prom, we carry most of the current colors in bow ties to match the dresses of your event. or quantity discounts on bulk bow tie orders.